If you have read my previous posts, you know that we went on vacation to Spain at the beginning of November. 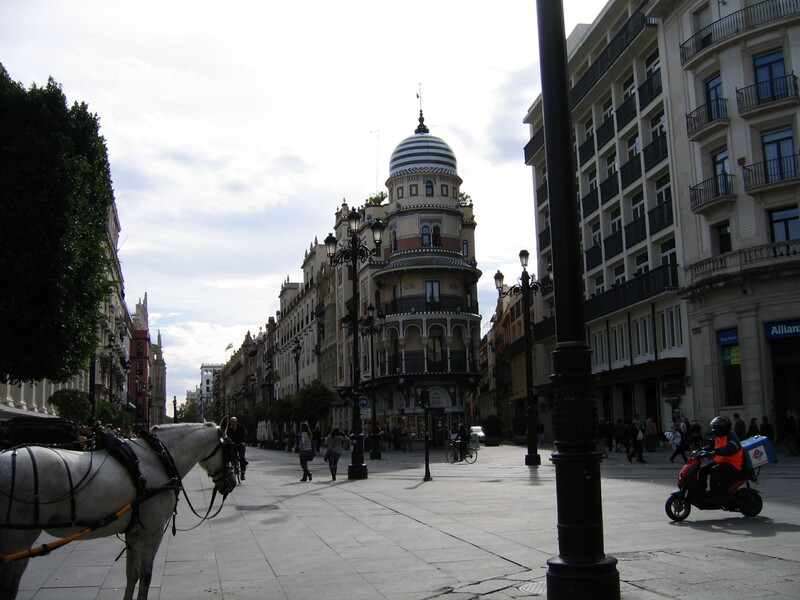 We visited Madrid, Barcelona, and Sevilla. This was the first trip for us to Europe. We had originally talked about going to the UK, but as the trip got moved to later in the year we decided that Spain would make more sense. As the trip got closer I started thinking more and more about what it would be like to visit the country of my long ago ancestors. During the trip I posted a blog entry about my ancestry, and about what this trip was starting to mean. A month later, I can finally write what this trip was like. I love that some airlines show you exactly where you are at the moment. During this flight, after the second movie, the screen continually updated with our location. When we were just about over the coast of Portugal, I stopped reading and just watched out the window. I began seeing the outline of the coast, and soon I was seeing little Portuguese coast towns. That is when it hit me, I was about to arrive to Europe for the first time in my life. Maybe that is not a big deal to most people, but Europe has always figured large in my mental geography. Growing up I felt a tug of war in my heart between USA and Europe. USA was where everything cool was from, but Europe was where everything classic was from. That morning I saw the sunrise over the Iberian Peninsula and watched Madrid wake up. Cervantes once said “sea moderado tu sueño; que el que no madruga con el sol, no goza del día.” I did enjoy that day, and every day I woke up in my unexpected home. 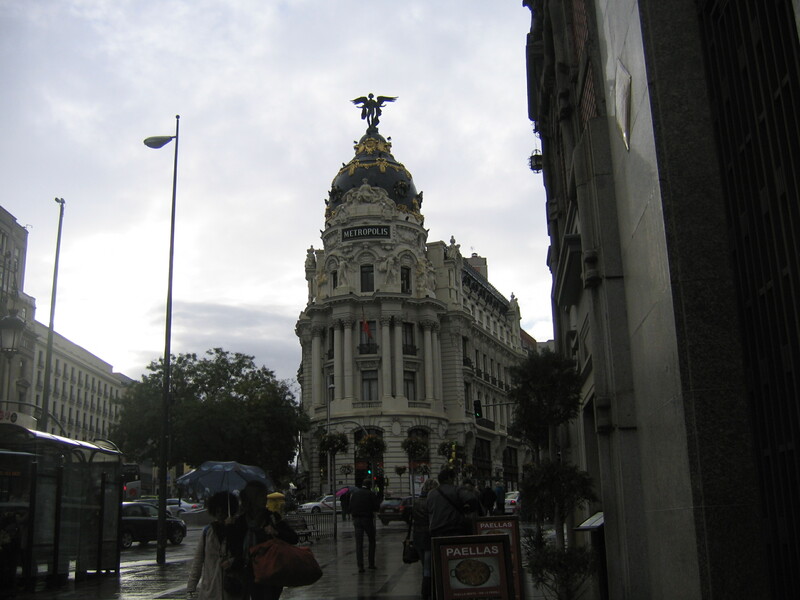 The streets of Madrid seemed at once very familiar, and very strange. The waves of people washed over us, as we walked. I didn’t expect to see so many Latin Americans everywhere we went. Of course, it makes sense, but Colombian accents would regular rise and wane around me, building that feeling that I was home. Madrid felt, and looked, like the old parts of my native Bogota. Like Bogotanos, Madrileños seem like a serious and dour lot. Maybe it is because we were there in the rain, or maybe because the economy is not doing well. Whatever the reason, the people looked as familiar as those back in my native home. Speaking of that, when I realized that I looked like every other guy in the street with my dark hair, brown eyes, and short stature the feeling of home cemented. In the US, I’m not white, I’m brown and ethnic. In Spain, I was just another European, or just another Spaniard. For someone that “relishes” being the odd man out, it was comforting that I didn’t have to pretend there. I was just another guy. 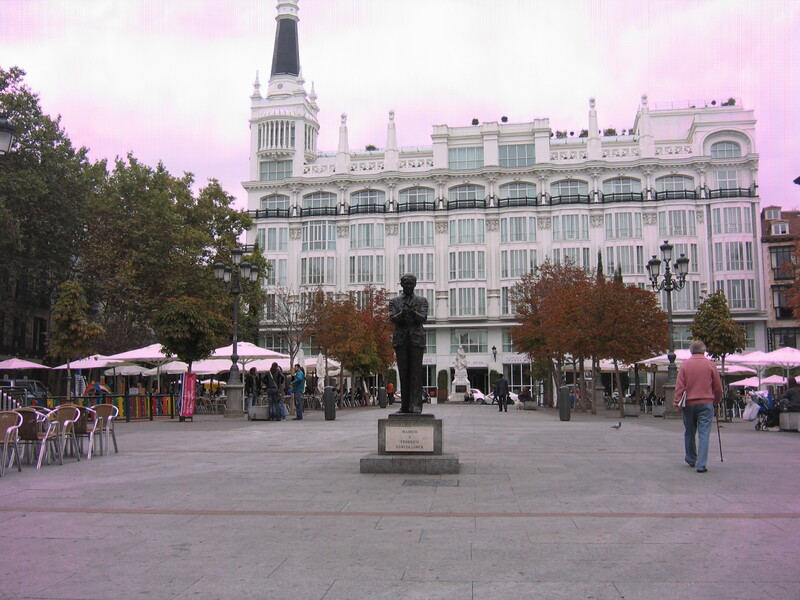 Eating in Madrid proved to be tricky, as we both expected, being vegetarian. It seems that every restaurant in Madrid, and every other part of Spain we saw, has the identical menu. The vegetarian tapas available to us were limited to Patatas Bravas, Torta Española and Manchego. If we had been vegan, we would have starved for sure. For one meal we had Indian, which is as familiar to us, as a burger is to an American carnivore. We did enjoy the café culture, and took every opportunity to eat outside even in the rain. We partook of the early evening snack mini-meal. Our hotel was right next to a Chocolate Valor http://www.valor.es/valor.asp café. We visited it every night we were in Madrid. There was one thing, and only one thing that I needed to do in Madrid, go to El Prado, the national museum of Spain. I have to say that while the museum is amazing, I was a bit disappointed. The week before we left for Spain, Mandy and I spent two days at the American National Museum in DC. There we saw so many Flemish, and Spanish works of art, that going to El Prado, was just more of the same. The American National Museum had pieces from the Renaissance through modern time, including several Picassos, Lichtensteins and Warhols. El Prado, while rich in their collection of Renaissance through the 19th century works of art, just tired us. How many paintings of the Madonna or of crucified Jesus can one person appreciate in one day? “La abundancia de las cosas, aunque no sean buenas, hacen que no se estimen, y la carestía, aun de las malas, se estima en algo.” Cervantes. Traveling through Spain via train is fantastic. We had second class tickets, but it felt like we were first class. I wish Amtrak trains were half as nice as Renfe trains. For a large part of the trip to Barcelona, I looked out the window. All the time I wondered if any of my ancestors had ever seen that mound, or that other mound. The land was arid for most of the trip, but there were vineyards everywhere. Arriving to Barcelona in torrential rain limited what we could see right from the start. 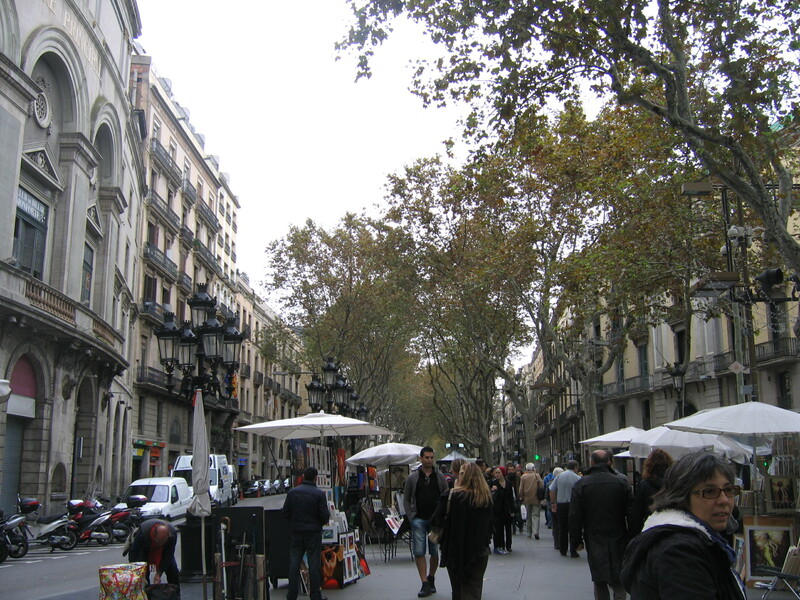 It turned out that our hotel was right in El Triangle, next to the Plaça de Catalunya and La Ramblera, the hub of the city and where every tourist in the world seems to be always. Barcelona seemed wholly different from Madrid. The Spanish that seemed so alluring in Madrid was replaced but the very familiar, but just strange enough to freak me out, Catalan. To my untrained ear, Catalan seems like French being spoken by a Spaniard, and nearly comprehensible to me. Luckily everyone speaks five or six languages, so whatever we said in whatever half-language we said was instantly understood. The first night we had a waiter that spoke to us in Spanish, Catalan, and English interchangeably; we responded in Spanish, and English and it was fine. Barcelona is a crossroad that Madrid is not, not that far from France, and even Italy, with its own very proud non-Spanish heritage. We were in love with the city straight away. I’m certain we met fewer natives in Barcelona, than we did in Madrid, but the people were happy, hipper, and certainly friendlier. The word for Barcelona was “architecture.” We visited as many Antoni Gaudí buildings as we could including La Sagrada Familia, La Pedrera, Casa Batlló, Casa Calvet, and Palau Güell. 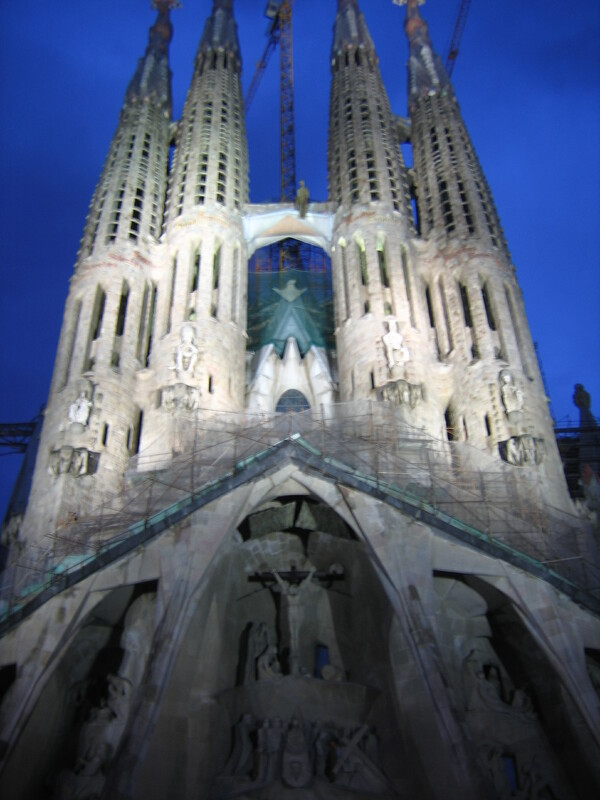 The vast variety of architecture of the city is breathtaking, even aside Gaudí. There are Art Deco, Gothic, Bauhaus, Classic Spanish, Post-Modern, and all other schools you can name. 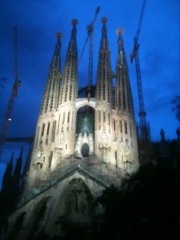 Someone told me that being in Barcelona is like being in New York. That comment makes both cities a disservice. They are cosmopolitan cities, and as such have many similarities, but the Catalan character of Barcelona is undeniable. We will be back, for sure. Food was slightly better in Barcelona. It was still difficult to find vegetarian food, as all the tapas restaurants suffer from the same menu problem than the rest of Spain. The superstar Chefs of Barcelona are enamored with game meats, so their fancy restaurants, that do sound amazing, were not welcoming. We did find alternatives, and there are several vegetarian restaurants. 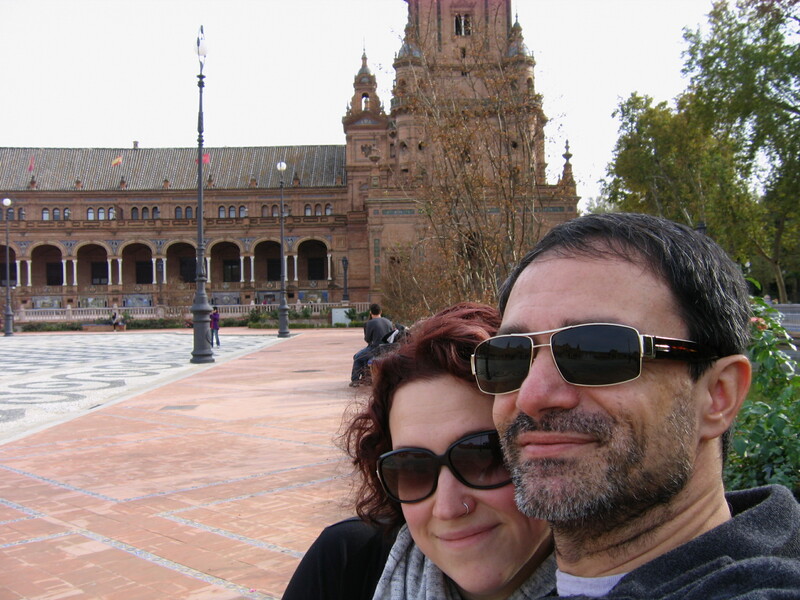 From Barcelona we traveled diagonally across the country to Sevilla. I was looking forward to that trip as I would be going very close to my ancestral home just north of Ciudad Real. 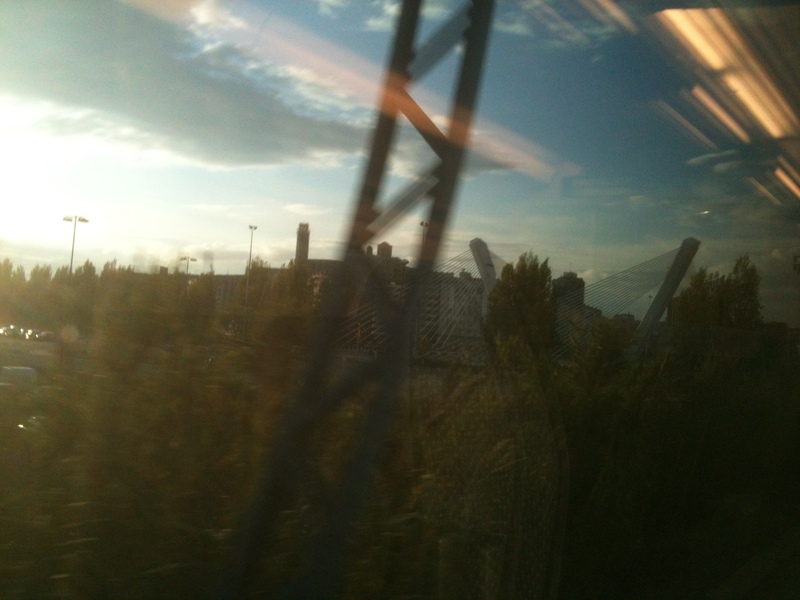 I hadn’t realized that by the time we went through Ciudad Real it would be dark, and I wouldn’t see anything beyond the train station. The trip was long, but beautiful until sunset with long stretches of vineyards, and farms. We arrived to our hotel in Sevilla around 10 PM, having not had dinner. Immediately we set out to find something to eat, which was not as tricky. In the preceding days we had figured out how to find food, but what we hadn’t counted on was the crazy streets of a once Roman city. We did find food, but once again we were pleased with the little bit of the city we saw. I don’t think we ever got over the fact that no matter what day it is, restaurants and pubs throughout Spain are open at least past midnight. Children are out in the plazas playing football past 10 on a school night. While Sevilla is older and poorer than what we had seen up to then, people are friendlier, and happier than even the Catalans. Sevilla’s vibe is one of relaxation, with a distinct Andalusian bent. We thought we had seen cafés everywhere in Madrid and Barcelona; Sevilla has them even more so. It is also where the stereotype of Spanish culture comes from with Flamencos, Matadors, Andalusian horses, and Gypsies. A Gypsy woman accosted us, and “read” our future as we tried to get away. She then demanded we pay her for her services. Eventually we did give her four Euros, so she would stop bothering us. 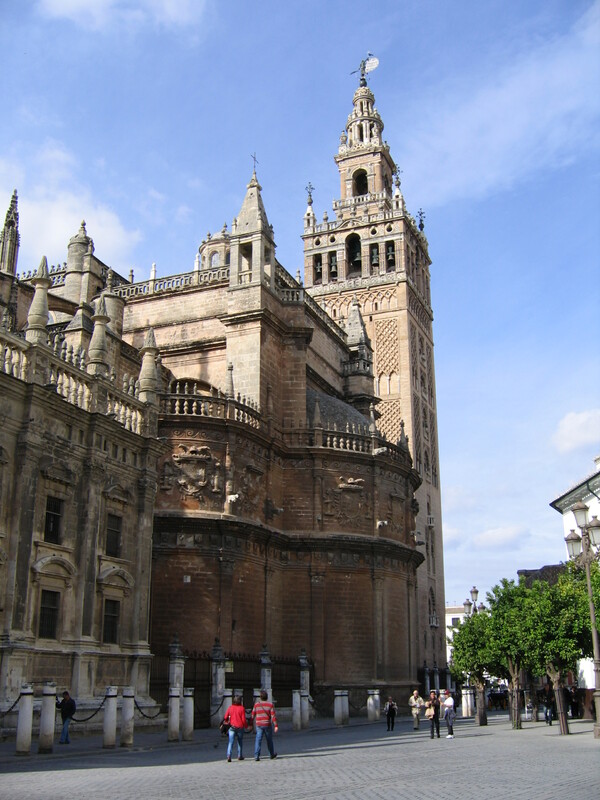 The architecture and art of Sevilla is an amazing combination of Classic Spanish, Roman, Moor and Jewish influences. We spent a bit of time at Sevilla’s Cathedral, the third largest cathedral in Europe after Rome’s Basilica and London’s Saint Paul’s. Also, we visited the huge Plaza de España, the Spanish Pavillion for a World Expo, and what is now the Univesidad de Sevilla, the building where the fictional Carmen of Mérimée/Bizet’s fame was said to have worked. 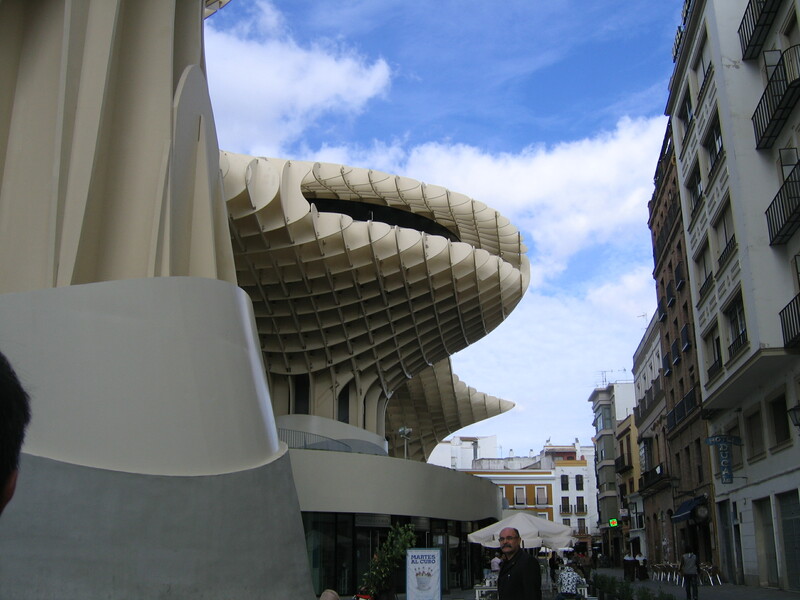 Just when we thought we got the overall mix of architecture, we came upon Plaza de la Encarnacion and the new Metropol Parasol, the world largest wooden structure, http://www.yatzer.com/Metropol-Parasol-The-World-s-Largest-Wooden-Structure-J-MAYER-H-Architects. We did sit around and drink coffee a lot and watched people, our favorite sport. We enjoyed Sevilla’s people the best. We saw stereotypical romantic Europeans stopping at a street corner just to make out, German tourists in sandals and socks, and loud Brits. Which reminds me; Americans get a bad rap about being ugly and loud, but British tourists seemed to be more obnoxious, more demanding of special treatment, and louder than everyone else. I now wonder if Europeans think that every obnoxious person speaking English is American, when they might be from Kent? In Sevilla we found a Cuban tapas restaurant, with a large vegetarian menu. We made sure we ate there a couple of times. Why can’t we have restaurants like that in the Boston area? I could go for some fufu and yucca right now. We liked Sevilla the best from the three cities. It was grittier, but more real, more accessible. The city seemed to be filled with happiness. We also stayed at the coolest hotel, a building built in the 16th century, that while maintaining its original architecture inside, it was updated and felt very modern, and clean. The last bit of our trip was going back to Madrid. This was my last chance in this trip to get a good look at Ciudad Real, as our train stopped there. The train trip, like the others was fabulous. 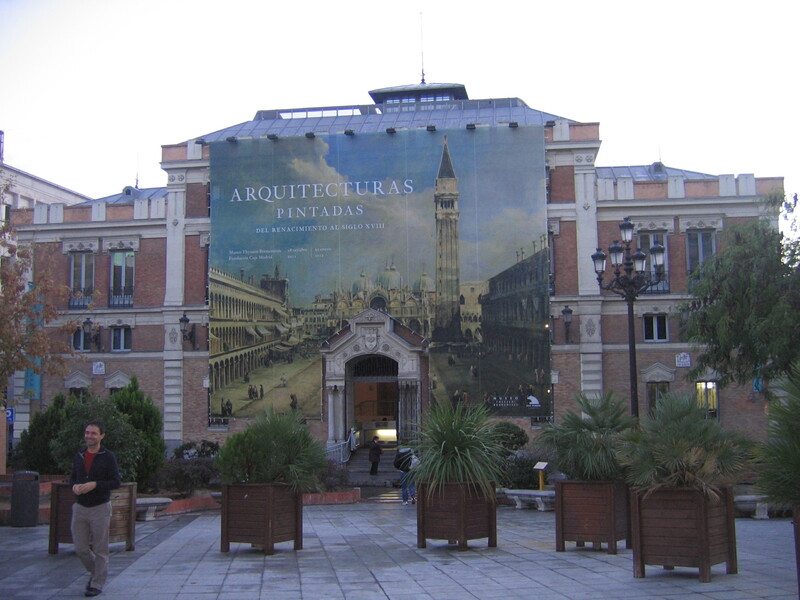 Arriving to Ciudad Real was similar to arriving at some of the other cities that we went by, like Zaragoza. 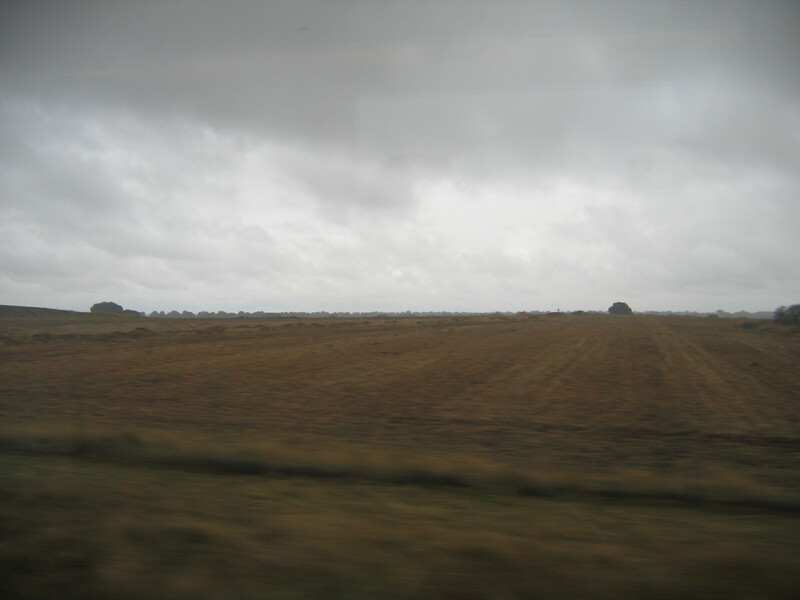 However, I did get a bit emotional seeing what I could see from the train. I tried to get a couple of pictures but none of them came out. Still, I was a few miles away from my ancestral home and for the last time I thought that my ancestors had seen this very area hundreds of years ago. Aside from the sights, sounds, smells and flavors that I now carry in my memory of the mother country, I was able to put it in some sort of context in my head. Long ago when I first arrived to the US, I was embarrassed to tell people that I was Colombian, or Spanish. The way that mainstream Americans seem to think of Latinos has changed for the better, but only a little since. However, I’ve been very proud of my roots for many years. I can now be proud of what I still have in me of beautiful Spain, and I can say that I understand it better, having spent a few days there. I’m still not going to eat their jamon Iberico, nor am I ever going to attend a bull fight, but I feel part, however distant, of the country that are the current Football World Champions, that gave us the insane creativity of Gaudi, or that gave us Lorca and Cervantes. A few years ago I decided to help a friend trace her roots. It was an amazing process, made so much easier by the advent of the Internet, and the good people from the Church of the Latter Day Saints. Yes, the Mormons. The Mormons have this practice of baptizing their ancestors to help them reach Mormon heaven. Apparently, until we are baptized into LDS when we die we all hang out in non-believer limbo, which is probably a place where you get to drink alcohol, caffeine, and watch Project Runway all day. When we are rescued by our descendants, who have now moved to Utah, and have voted in Mitt Romney IV as the new president, we get to go to the heavenly kingdom. I picture it as Provo, only blonder, more conservative, and with lots of Osmonds. By the way, I hereby forbid any of my descendants to baptize me. I want to see Mondo lose again, while I sip a cappuccino. It is my special kind of hell. LDS followers have done such an amazing job of tracking their ancestors that they have launched ancestry.com, the largest online genealogy website. For a price, you can sign up and if you have the time and inclination, and you are lucky to have had someone already do the hard work, you can easily trace your roots back to the old country. In the process, I learned a lot about European history, but more importantly about early European immigrants to the US. One of the more interesting bits was a diatribe by a conservative loyalist to the Crown, who was besides himself about the latest influx of lazy no-good ungodly Germans that were arriving to New York, and Philadelphia. He talked about how the government had to close the borders to these dirty people. I guess conservatives just don’t change. Once complete, my masterpiece, that took me well beyond ancestry.com, and that exercised my dying ability to read German, was delivered to my friend and her family. The document was passed around getting some lukewarm reception and quickly abandoned for a plate of cookies. I had to remind myself that it was the journey that mattered. My learning was worth the twenty dollars, and the hours spent on the project. A few weeks later, another friend asked me to help her do the same. This time I got lucky very quickly, and was able to serve her with a family summary that someone else had done for a very distant cousin. She was excited to find out the story of her great grandfather who had moved from London to Jamaica where she had married a young lady. The family always suspected that the young lady was mulatto, because many of them had dark skin. I found census records that showed that she at least passed as white, when they moved to New York City during the early twentieth century. She loved the story. Of course, during this time I tried to do the same with my family roots, but apparently records in Latin America either aren’t very good, they haven’t gotten unto the Internet, or LDS hasn’t converted many of my cousins yet. Most searches ended on dead ends. A few years ago National Geographic launched a project to perform analysis of Y-chromosomes (of course men designed this) of indigenous people looking for genetic maps of human migration from our original African ancestors. The project continues, but they have been successful in mapping a general pattern of migration starting in and around sub-Saharan Africa, out to the middle East and up to Central Asia. The Central Asian group then divides into a couple of European branches, branches that goes into Asia, and another that goes into the Americas. Those branches divide further. Interestingly, aside from those in Africa, the earliest related branch to the original humans are not in the Middle-East but are the Australian Aborigines. They are unclear on how this happened, but they seem to think that a branch quickly moved through India out to Australia, before any of the branches in other areas cemented. After years of starts and stops looking at bits of what I could find, I decided to participate in this study. My genetics tell me that thirty thousand years ago, my paternal Cro-Magnon ancestors settled not far from where I sit right now, in Spain. Ninety percent of Spaniards, as well as Irish, and seventy percent of Brits, also share this ancestry with me. I found these facts a few weeks ago just in time for my first trip to Spain. The facts are not much of a surprise, as I clearly know where my family comes from. My biological paternal grandfather was a fair skinned, blond man with green eyes, and small stature with the last name of Ruiz. He would easily blend in with the crowds I have seen today in Barcelona. I know nothing more about him. I don’t even know what his first name was, as I’m sure he’s not with us; he’d be in his 100s now. My Nona, never married Señor Ruiz; he was already married. Gladly I carry her surname instead, Jimenez, an incredibly common last name in Spain and all former Spanish colonies, that means nothing more than “Son of Ximeno.” This Ximeno fellow has ancestors in places like the Philippines, Guatemala, Spain, and my native Colombia; not to mention the US contingent that sometimes has allowed idiots to change the name to Jiminez. I have often thought, why don’t they just give up and just change it Jimson or Jameson? Anyway back to the Ruizes, I don’t know when they left this peninsula for the new world. If it was early in the 16th century, it was possibly just a single male Ruiz who was with the hordes of Conquistadors looking for gold. If it was later, as I suspect from Señor Ruiz’s description, it was possibly a family looking to move up in social rank. A Spaniard family in the colonies would be placed in an instant as high society. The story goes that his family was a well to do family, as was my Nona’s. He was an older married man, and she was an impressionable and naive teenager. Her mistakes, two of them, meant she lost her status and was shunned forever from the Jimenezes, and her children never were acknowledged by the Ruizes. The paternal line is a complete blank from 1492 to mid 20th century for me. I can easily imagine that before Columbus, my ancestors were in the ebb and flow of Western Europe, once just simple hunter gatherers, then farmers or fishermen, under the rule of Rome, or the Moors, or whatever local King was in power. One day they picked up, left, and landed in the shores of South America, and made it inland. They met others that had also made the trip, or had been in the land before the Spaniards, and continued the line. My Jimenezes are also a mystery to me for the same “mistakes” Nona made. They also were of fair skin and well to do, which belies direct Spanish ancestry, but since we were cut off from most of the family, we grew up with no stories about the past. Once when I was 7, I asked Nona about where we came from. With a glint in her eye, she looked around and whispered “some of our family are from la bella Italia.” I told my Dad this many years later and he shook his head. He’s not one to speak badly of his blessed mother, he simply answered “I never heard that.” Nona was a flighty, naive, capricious, but tenacious woman. She could have just imagined that. I like to keep her flight of fancy alive in my daydreams. I know my ancestors lived in Spain, but why not Italy too? I had some success with my maternal lineage, more precisely my maternal grandfather’s line. A nice lady from New Orleans did a great summary of the family, that I stumbled upon one night searching the web. The story goes that sometime in the 14th century there was a King or Prince in what is present-day Ciudad Real (Royal City), Spain. He fell in love with a Jewish/Sephardi woman that had my grandfather’s surname. Being a royal of a Catholic territory, he couldn’t take her family into the palace, so he build a town just north of Ciudad Real that bears the name of her family, where he relocated her family, when they married. She converted to Catholicism, but her family was allowed to keep the Jewish faith. A couple hundred years later or so, in 1492, Spain united into one kingdom and expelled the Moors back across the Mediterranean. Feeling Catholic piety, the King and Queen began a process to cleanse Holy Spain from those that were unfaithful to the Pope and Rome. The Sephardi across Spain had to decide to stay in the country and convert, or leave. Some converted but in secret kept the Jewish faith. To prove that they were no longer Jews, they ate pork regularly, and came to be nicknamed “Marranos” or pigs. Often they were scorned and said to smell like the pigs they ate. Many were burned at the stake, or suffered worse fates at the hands of the Spanish Inquisition. Funny enough given the amount of ham I have seen since I arrived to Spain a week ago, it seems everyone is a Marrano in this country. My ancestors didn’t stick in Spain. Some moved to France, Ireland, and the Netherlands. Those that stayed in France and Ireland eventually changed their surnames to match local spelling and converted to Catholicism or Protestantism. Some that stayed in the Netherlands moved East and commingled with Ashkenazi Jews in Northern and Eastern Europe. My ancestors took a different route. During the colonial race between the superpowers of Spain, Portugal, and the Netherlands, the Dutch were having a hard time finding men or families to move to the New World under the Dutch flag. They offered any European, regardless of background, to move to the Dutch Antilles, or Dutch Guyana under the Netherlands’ flag, and receive Dutch citizenship and land. Many Sephardi took them up on it, including my ancestors. As it always has happened with the chosen people, they couldn’t stay too comfortable in one place, and had to move west entering Venezuela. Of course, that brought them back into the purview of the Spanish Inquisition and finally they too gave up, and converted to Catholicism. One of my ancestors became a well known revolutionary who helped Simon Bolivar, the great General that defeated the Spaniards and liberated five separate colonies from Venezuela to Bolivia, to begin his campaign. Sometime between the mid-19th century, a branch of the family moved west once again arriving in Colombia. That is the one cool story I have of my ancestry. The glitch however, is that I can’t directly tie my family to those in the little town in Spain. The Original researcher, and I had to assume that given that the name is very rare that all of us that share it came from the same place. Tomorrow our train between Barcelona and Sevilla will be going by near that town. I wonder if there will be any kind of ancestral recognition, if that could even be possible. During this trip, all of this has been top of mind. I keep looking at those that are Spaniards, searching for a slight feeling, a gesture, something that makes me feel like this is indeed my place of origin. It’s not easy given that at least half of the Spanish-speaking people I have encountered are not Spaniards. Also I have probably heard more English spoken in Barcelona, than Spanish. It doesn’t help that the local Barcelonians speak Catalan. I may not have had a feeling, or anything cathartic happen yet. The truth is there is no denying I look like these people. I don’t feel like a dwarf walking around Madrid or Barcelona. I blend in easily, something I haven’t been able to do in thirty years. I bet I could actually buy clothes at the stores that actually fit. So yes, I’m home. The home of most of my ancestors, at least. The home that was once stolen from part of them, or the home that was willingly given away in search for a better one. Funny enough, I’m not a Catholic, or a Jew. I speak Spanish only about 1% of my usual day. Pero, esta si es my España. This is my Spain.